Well, we cleaned up the workshop for varnishing and well. Its 70 degrees here in Virginia, so much for the cold bitter winter. I took this shot thinking how clean it was. Upon further inspection I think we need to clean it again. If you look closely there’s some dust on the moose head. Happy Tuesday. A Classic Boat In Your House? Yup! Miss America Visits Lake Hopatcong. No Not The Boat, The Miss! Hey, if you blow the dust off that old moose head you’ll have to start from scratch on everything the dust settles onto. I don’t have a moose head to worry about but I do have plenty of high, out of the way storage areas that hardly ever get attention when preparing for finishing things. I do have a fish that’s kind of cool but nothing else like that in my shop. 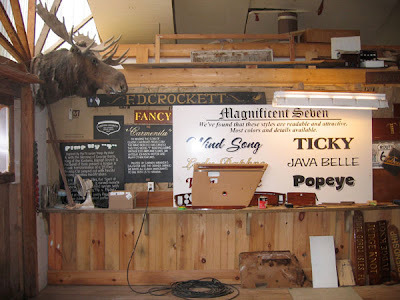 I like the moose head, it adds a touch of class to your shop. The signs are cool too. As long as I don’t need to get something down or let a stiff breeze blow through while I’m finishing something I just let that part of the shop go till Summer.